When your last name is Carradine, one automatically assumes acting is your destiny. But for actress Ever Carradine, her initial ambition was to be an anthropologist. It was only a matter of time, however, before the acting bug in her blood took over; she switched her major to theater and has never looked back since. In various roles on both the big and small screens, Carradine found her passion. Her current projects include the highly acclaimed “The Handmaids Tale” and the hit series “Marvel’s Runaways”, both on Hulu. 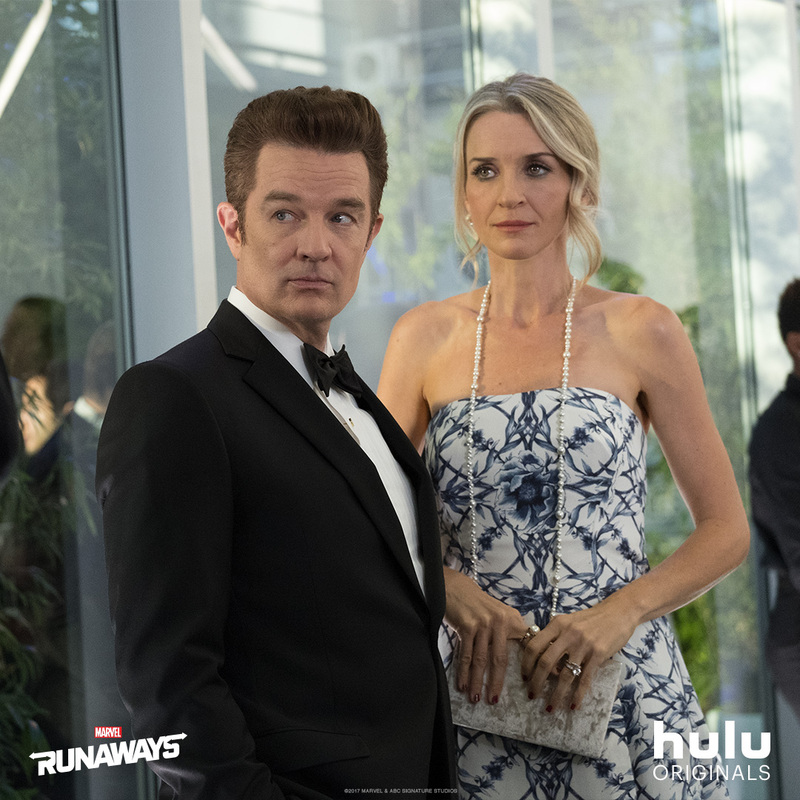 The Overhead Compartment caught up with the ever-busy Ever Carradine to find out what it’s like balancing two hit shows, while staying balanced in life. 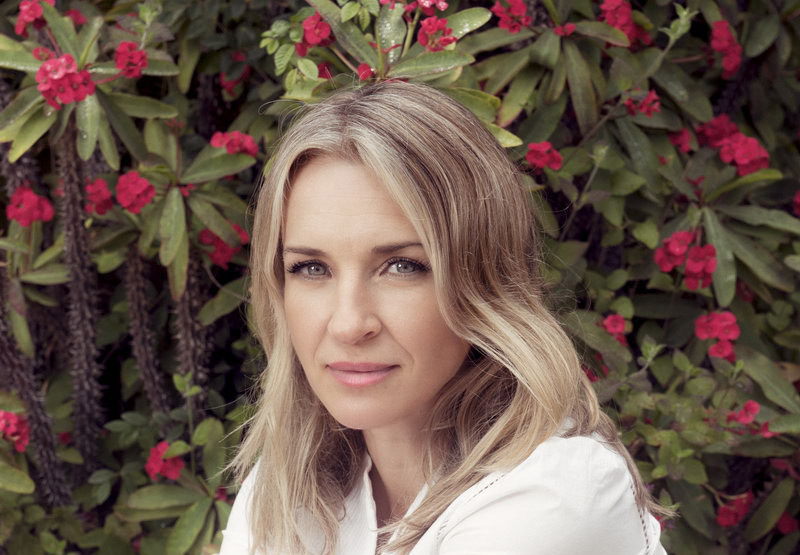 The Overhead Compartment with Ever Carradine begins now…. 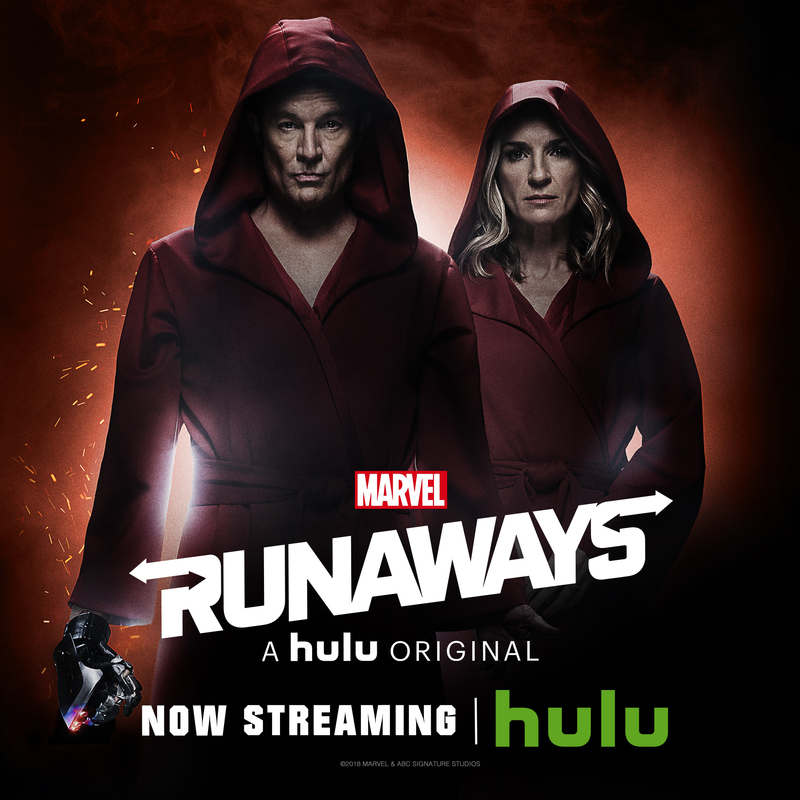 OC: You star in two hits on Hulu: Handmaid’s Tale and Marvel’s Runaways. What are the challenges of shooting two such different shows simultaneously? EC: Luckily, they shoot on exact opposite schedules. I went from wrapping the first season of “The Handmaid’s Tale” on a Wednesday to flying home and auditioning for “Marvel’s Runaways” on Thursday. By Friday I had the job and was at work the following Monday. And then it happened very similarly as I wrapped the first season of “Runaways.” We were shooting nights our last week, so I wrapped at 6am and was on a 1pm flight to Toronto (that same day) to begin filming the second season of “Handmaid’s Tale.” I think this year there is something like three weeks between “Handmaid’s Tale” wrap and “Runaways” beginning production. It’s been busy, but a dream come true. OC: What is the most enjoyable part of each of them? EC: Besides being able to film “Marvel’s Runaways” at home, which means I get to sleep in my own bed and wake up with my kids, I have to say it’s the cast. I love the show so much, but I honestly might love the cast even more. One bad apple can spoil the bunch pretty quickly on a set, and I can honestly say that we don’t have one. Everyone is kind, funny, smart and very good at their job. And “The Handmaid’s Tale” doesn’t feel like a job to me. The travel part does, but not the work. To be a part of something that has sparked so much conversation feels immensely rewarding. I am a very small part of a very big thing, and it has been one of the most rewarding experiences of my career. The clothes are good, too. OC: You also had a recurring role on ‘Shameless’ with William H. Macy. What is one example you witnessed from his legendary intensity? EC: “Shameless” was the first job after I had my second child. I went to work five weeks after he was born, which is way too soon. That being said, it’s all a little bit of a blur. But Bill Macy would play his ukulele between takes and it was heaven. OC: You come from an acting family and went to college to study anthropology and then switched to major in theater. What ultimately drew you back to acting? EC: I just remember sitting in class studying Southeast Asia and discussing field study, and acting sounded way more fun. I dropped the class, called my dad and changed my major. I knew if I could figure out how to act for a living, I would always love going to work – and I do. OC: How much could you tell me about anthropology? EC: Probably never taking them off of it. Coming from a family of actors, I have always known that it is about the work. And that every member of the crew is just as (if not more) important than the actors. I just try to do my job and do it well. Know the crew’s names, come to work prepared and on time. Simple stuff, really. I also know how very lucky I am to do what I do. EC: One of my favorite places to film is Vancouver, BC, especially in the summer. OC: How would you spend a perfect day there? EC: When I was filming “Eureka,” I lived there for a summer. I bought a bike on day one and that was my only mode of transportation. I biked every inch of that city and Stanley Park. Such a special place. A perfect day would start at Cafe Artigiano, then a bike ride in Stanley Park. Maybe lunch from the salad bar at Caper’s and dinner at Tavola or Vig’s. OC: You have two kids, favorite family vacation? EC: Last family vacation was Sun Valley, Idaho. Our seven-year-old is a pretty good skier, so we put our two-year-old on skis and got to ski and ride the chair lift as a family. It was dreamy. A lot of work, but so much fun. OC: You grew up and live in LA, top three favorite restaurants? EC: Our go-to is Pace. It’s in Laurel Canyon, which is where we live. It’s the closest thing we have to a neighborhood restaurant. I love Jon and Vinny’s. I have never had a meal there that didn’t leave me full and happy. I also love Otium downtown. Bonus is Joan’s on 3rd. We’re there at least three times a week for lunch/take-out/dinner/cupcakes. It feels like it’s an extension of our kitchen. EC: Unpack. Then I use Clorox wipes on the phone and TV remote. EC: Well, I don’t ever leave without my purse, which is full of the obvious goodies. Wallet, lip balm, iPhone (i.e. pictures of my kids) and Dr Bronner’s lavender hand sanitizer. I also usually pack a few lollypops in my bag in case one of my kids needs to be distracted or bribed. Altoids also work, but the lollypop really gets the job done. Ever Carradine, please use care upon departure as items may have shifted in The Overhead Compartment during our journey. Thanks for choosing us for your travel tips! Have a wonderful day!